Morgan James Publishing, 9781642791259, 170pp. 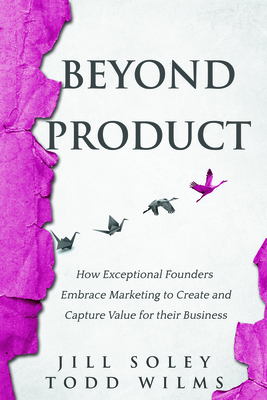 Beyond Product serves as a roadmap for dreamers, big idea people, founders, entrepreneurs, and trailblazers to transport their ideas from concept to successful business. Most of these new businesses fail. The world expects the creators of these brilliant ideas to be great at everything, but most struggle along the way. The best product doesn't always win. Even good products need a good strategy for bringing them to market. Beyond Product provides the missing link for entrepreneurs and founders to turn their ideas into successful businesses. More than 50 business leaders have lent their perspectives and joined with marketers Todd Wilms and Jill Soley to help the big-idea crowd bring their passion to the marketplace and find their customer. Beyond Product shows founders how to take their organization through various stages of growth, overcome obstacles, and learn from common mistakes. For every founder who ever found it lonely at the top, this roadmap serves as a coveted best friend as they launch their great idea into the market.